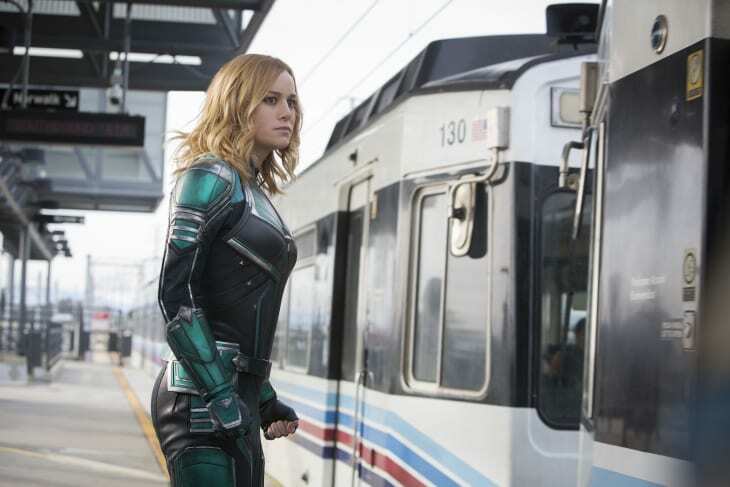 We’re looking forward to seeing the sequence in “Captain Marvel” involving a Blue Line train — the movie hits theaters tonight. LAist has a post looking at some other Metro cameos in movies, most of which seem to involve chases, shootouts or other things definitely not encouraged by our Code of Conduct. Things to read whilst transiting: In the movie, Captain Marvel falls from space and lands on/in a Blockbuster video store. The NYT has a fun article about the last remaining Blockbuster — in Bend, Oregon, of all places. •Some DTLA stakeholders aren’t happy that the Artesia to DTLA light rail line won’t have a Pershing Square Station, reports the Downtown News. The Metro Board last year voted to instead continue studying two end points for the line — either adjacent to the 7th/Metro Station or an underground station on the Alemeda Street side of Union Station. Ridership and cost effectiveness per new rider performed better at 7th/Metro than at Pershing Square. The Pershing Square alignment had potentially greater impacts to historic buildings and other difficult design issues. 7th/Metro provides better transfers to the Metro system since it would offer transfers to both the Red/Purple Line and light rail lines headed to East L.A., Santa Monica, Long Beach and the Foothill Corridor in the San Gabriel Valley. The thesis here: both services — both of which are headed toward initial public offerings on the stock market — are much cheaper than taxis because they’re heavily subsidized by investors and by drivings willing to work for cheap. That, columnist Megan McArdle predicts, simply can’t last forever. In other words, if it seems too good to be true, it probably is and ride share fares, McArdle says, will likely rise significantly. My three cents: she’s probably right. I don’t use Uber or Lyft much — mostly just to get to and from the Cincy airport, which is very fast and affordable — but I’ve yet to meet a driver who doesn’t like to complain voluminously about the pay. If or if not they’re asked. Of course, a lot has been written about how rideshare is taking/stealing/borrowing riders from transit. I’m not entirely wild about that thesis. I think rideshare is really a call for the transit industry to put their clever hats and win riders back. And: I think there are times when transit and ride share work well together — the places where transit can get you most of the way there for very cheap and ride share can close the gap for not quite as cheap. •The Las Vegas Convention and Visitors Authority wants to give Elon Musk’s Boring Co. a contract to build and operate underground tunnels to whisk people around Lucky Town, reports MarketPlace. It’s the same type of system that the Boring Co. aspires to build in L.A. between Dodger Stadium and the Red Line. You know, the Teslas-on-skates approach. This system would initially help people get around the Las Vegas convention center and later could be expanded to other Vegas destinations. If expanded to southern Utah so that I can quickly escape the orbit of Vegas, I will ride. •Ron Tutor talks about his company’s work on the second and third sections of the Purple Line Extension project in the Park La Brea News. •Transit-oriented developments haven’t exactly bloomed like wildflowers along the Gold Line in the city of Los Angeles. But it looks like a second TOD will soon rise near the Heritage Square Station — this one with 55 residential units, according to the Real Deal. •LAT publishes three letters-to-the-editor on the Metro’s Board decision last week to launch a congestion relief pricing feasibility study. The first calls for more street repair to help ease congestion, the second says the Metro transit system doesn’t provide enough of an alternative to driving and the third cites an artificial intelligence system in China used to better sync traffic signals, which has reportedly improved traffic flow. Unrelated: Any reason why construction update pics for Crenshaw Line are so few and far between? I would also want to know why. If you’re a film buff I would recommend checking them out, they’re all quite good! “Transit-oriented developments haven’t exactly bloomed like wildflowers along the Gold Line in the city of Los Angeles”. Maybe Metro should demand cities upzone around stations before committing to build rail lines and not put blind faith that the cities will do so afterwards? The City of Los Angeles has upzoned through TOC and should be rewarded over other cities that do not. Will Metro take a stand on this? I drove for Lyft part-time when it started and now I’ll turn it on while I’m on my way home to see if anyone needs a ride. When I started the fares were much higher (I’d say about 30% more) and the surge pricing would go up faster. People were just happy to not have to depend on a taxi, have the convenience, and still save money off taxi rates. About a year in, Uber decided to drastically cut fares in order to gain market share and push Lyft out of cities that it had gotten a foothold. Uber probably thought it could absorb losses for longer since it was a larger company. A week later Lyft cut its fares by a similar amount. In order to prepare for the eventual IPOs they probably needed to get market share by any means necessary. The absurd thing was that most drivers drove for both companies and therefore were technically competing with each other to drive fares down. When I started the base fare was about 60% of a taxi fare and now it is about 40%. – It was filmed largely on the Expo line, which didn’t exist in the 90s, and even if it did, nobody would say that a train on it was “northbound.” Although they would have it if was supposed to be the Blue Line, which did exist in the 90s, so maybe that part was right? – They did use the old Blue Line cars for the exteriors but the interior finish and fabric were clearly from a newer car. – Did Metro ever let people walk between cars like they did in the movie? – The end of the line was 7th & Metro, true to life. We see Captain Marvel in the station by the stairs down to the Red Line, which could have existed in the 90s if it was after 1994. But then she emerged from the Civic Center station, which is a pretty good trick. I wouldn’t be surprised to learn that people with sharper eyes or deeper knowledge than mine noticed a bunch of other stuff.